Chana ( split chickea)dhal-A warm and hearty dhal, thick and chunky cooked in an array of aromatic spices. An ideal accompaniment to crispy finger parthas and rice. 1.Wash and soak the chana dhal in water over night. 3. In a pan heat the oil when hot add the mustard seeds and red chillies. 4. Add the garlic and saute for 30 seconds taking care not to burn it. 5.Add the pureed tomatoes, ginger and chopped chillies. 6.Add the salt, turmeric and chilli powder and cook till spices and tomatoes blended and tomatoes start to leave oil. 7. Add the cooked dhal to the spice mixture and simmer on medium heat for 10 minutes. 8. With the back of a ladle gently press the dhal to break some of it up to give thickness to dhal. Add a little more water if needed. 9.Adjust seasoning if required.Transfer to serving dish and garnish with chopped coriander. Serve with Crunchy finger parathas and rice. Serving suggestion: Break up the Crunchy parathas on a plate and pour over hot piping dhal. Eat immediately with onion and tomato salad. Mirch Masala My Legume Love Affair (MLLA) Edition 21 -event-brainchild of Susan of the well seasoned cook . Curry looks simply superb!! yumm yumm!! Looks so spicy and colorful.. Perfect for the event too..
Hey that looks like a very comforting bowl of dhal. Very versatile too..will go with probablu anything. Wonderful pics, very inviting and looks super delicious!!! I dont use ginger-garlic paste, but sounds flavorful!!! those crispy parathas with dal mmm would be lovely!!! 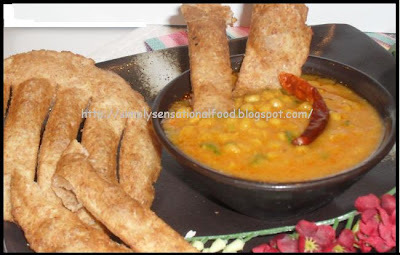 such delicious platter...nice and spicy..
Dal is such a versatile and filling dish...love your version! 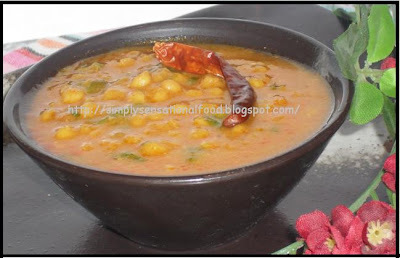 Real comforting food...nutritious and tempting dhal..
thats my fav curry..make it very often.. Your Chana daal looks great and fulfilling. Would try preparing as per your recipe very soon. YUM! I wish I could have a bowl of that today! Great idea! I love chickpeas but have never cooked with them so might give this recipe a try! I always get this from my local takeaway. I may try ad make it next time.